Matt Bowman missed 26 games with finger blisters. The St. Louis Cardinals announced several roster changes prior to Friday’s series opener with the Chicago Cubs. The Cardinals recalled first baseman Luke Voit from Double-A Springfield and activated right-hander Matt Bowman (right hand finger blisters) from the 10-day disabled list. Voit has appeared in five games for the Cardinals this season, and has two hits in four at-bats with one home run and three RBIs. His pinch-hit homer June 7 vs. Miami was the Cardinals’ first pinch-homer this season. 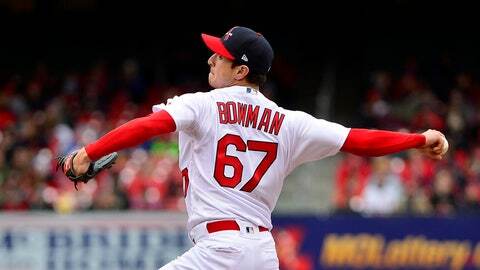 Bowman, who missed 26 games while on the disabled list from May 17 to June 14, is 0-1 with a 5.82 ERA in 17 games (17.0 innings) for the Cardinals this season. He made three appearances with Memphis during his recent injury rehabilitation assignment and worked 4.0 innings, allowing one run on three hits. The team also announced that first baseman José Martínez has been placed on the Paternity List and that rookie right-hander Daniel Poncedeleon was optioned to Triple-A Memphis following Wednesday night’s game. Poncedeleon, who was purchased from Memphis on Monday, did not see action in his three games with St. Louis. He is 5-2 with a 2.41 ERA in 12 games (11 starts) for Memphis this season. Martínez is leading the Cardinals in batting (.321), home runs (10) and RBIs (42), hitting safely in 10 of his last 11 games, including a stretch during which he’d homered in four of five games from June 7-11.